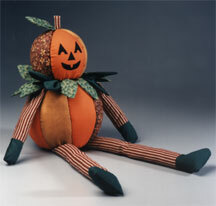 You will need to download our Free PDF Pumpkin Doll Pattern to make this project. — 1-1/4 yd. fabric, of each of the following: orange, tan and print for body; orange stripe for arms, legs and stem; green and green print for leaves. 1. Place four rubber bands around 6″ ball, dividing ball into four equal sections; mark lines with a sharp pencil. Repeat, dividing sections again, so ball is now divided into eight equal sections. Repeat with 5″ ball, dividing it into four equal sections. 2. Cut a 3/8″ slice from top and bottom of 6″ ball; cut a 3/8″ slice from bottom of 5″ ball. Redraw the lines that were sliced off, and then firmly score all lines with the tip of the pencil. Using the tip of a pencil, create a hole 1/2″ wide and 1/2″ deep in the center of top of the 5″ ball and the bottom of the 6″ ball. 3. Using Pattern A, cut out four pieces of batting for 5″ pumpkin; using Pattern C, cut eight pieces of batting for 6″ pumpkin. Glue batting to the center of each section. 4. Using Patterns B and D, cut fabric pieces for pumpkins: For 6″ pumpkin, cut four orange, two tan and two print pieces; for 5″ pumpkin, cut two orange, one tan and one print. 5. Working on one section at a time, center fabric piece over batting and “tuck” fabric edges into scored lines. To tuck the fabric, position the putty knife on top of the fabric and directly on the scored line, then gently push the excess fabric into the foam. Tuck one side and then the other, keeping the tension as even as possible between the two sides. Trim excess fabric. Once all sections are covered, push excess fabric into holes or if there is no hole, glue flat to the bottom or top of the pumpkin. 6. Make leaves: Using Pattern E, cut out 16 dark green leaves and 26 print leaves. Sew with 1/4″ seam and leaving bottom edge open (you should have 21 leaves). Trim close to seams and turn right side out; press. Gather several leaves at the open end to add dimension. Glue 20 leaves around top of 6″ pumpkin (see photo); save one leaf for pumpkin head. 7. Insert dowel 1 1/2″ deep into top of 6″ pumpkin; remove dowel and add glue to hole. Repeat, inserting dowel into bottom of 5″ pumpkin. Spread glue on dowel and on bottom of 5″ pumpkin. Insert dowel in holes and press two pumpkins together. 8. Arms: Cut two 6 1/2″ x 2 1/2″ pieces of striped fabric (arms) and two 2 1/2″ squares of green fabric (hands). Sew green hand to striped arm with a 1/4″ seam. Press seam open. Fold the arm in half lengthwise with right sides together. Sew 1/4″ seam, rounding the corners of the hand and leaving the end open at top of arm. Clip and turn arms; press and lightly stuff with fiberfill. Glue on arms, positioning close to neck and under leaves. 9. Legs: Cut two 11 1/2″ x 4 1/2″ strips of striped fabric (legs); cut feet from green fabric using Pattern F. Sew foot to leg with 1/4″ seam. Press seam open. Fold leg in half lengthwise with right sides together. Sew 1/4″ seam, leaving top of leg open. Trim seam and turn; press and lightly stuff with fiberfill. Glue legs to bottom of 6″ pumpkin. 10. To make stem, cut a 1 1/2″ x 1″ piece of striped fabric. Fold lengthwise with right sides together. Sew 1/4″ seam, leaving one end open. Trim seam, turn and lightly stuff with fiberfill. Place generous amount of glue in the hole at the top of head; push and twist stem firmly into hole. Insert remaining leaf next to stem. 11. Using patterns, cut facial features from black felt, or, design your own face. Glue features to face. 12. To finish, cut a 3 1/4″ circle from felt; glue to bottom of pumpkin. *Trademark of The Dow Chemical Company. Project reprinted courtesy of The Dow Chemical Company, Manufacturer of Genuine STYROFOAM(R) Brand Foam.